Photo Galleries Grand Charity Auction Christmas Charity Presentations Sport Helping local people Who we support Meetings and events Why join Rotary? It started at 10.00 and finished at 2.00 pm with a welcome hot and cold buffet meal at 12.30 to 12.45 with our 11 Rotarians. 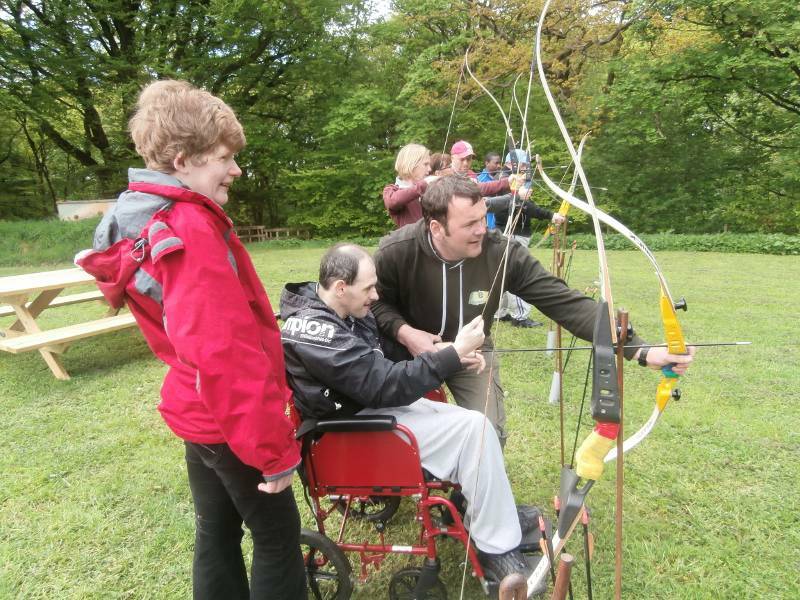 Funded by Padiham Rotary our handicapped guests and helpers first went on the archery range then climbed up two huge trees in the wood and abseiled down. After lunch they took it in turns to build and climb up (supported by rope) a 'tower' of milk crates. All thought the event went well and were keen to repeat it next year. This event replaced our annual barge trip. Jim from Outdoor Elements organised and lead the three activities whilst his wife Lee and her sister Jane made the buffet in the cabin.